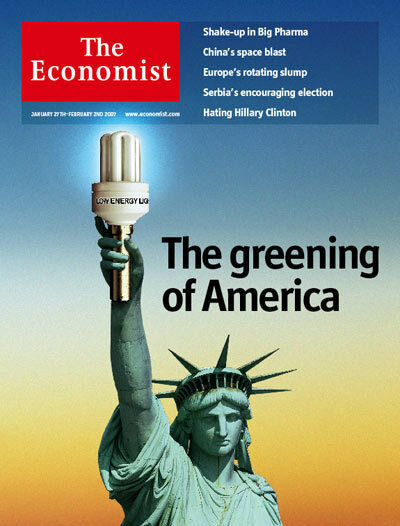 (un)Sustainable Comments: The Economist; more "Green America"
More big time press on the green movement gaining momentum in the good ol' US of A. It really is about time that the vaunted entrepreneurial spirit of the country that helped usher in the industrial revolution. After all, this bastion of capitalism and creating business opportunity should be looking at the massive opportunity to commercialize technologies and services that potentially solve the climate change problem. I have had a few acquaintances remark that the 2008 elections will usher in a dramatic change in US energy and climate change policies. The political and business leaders think about it for economic reasons, which is the right thing to do. They will package it as a way to create jobs and protect our children to get votes, and that's fine. Let's face it, whether anyone thinks environmental issues are a morally imperative thing to focus on, it can be viewed as another special interest, with vested interests and maneuvering organizations.